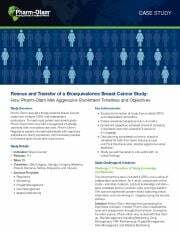 In this study, Pharm-Olam was called on to rescue a Breast Cancer bioequivalence study from multiple CROs and independent contractors. Rescue studies pose many challenges and are often filled with anxiety and concern from all parties involved project. Learn how Pharm-Olam handled the transition process to successfully support the study sponsor with aggressive patient recruitment timelines and regulatory challenges.